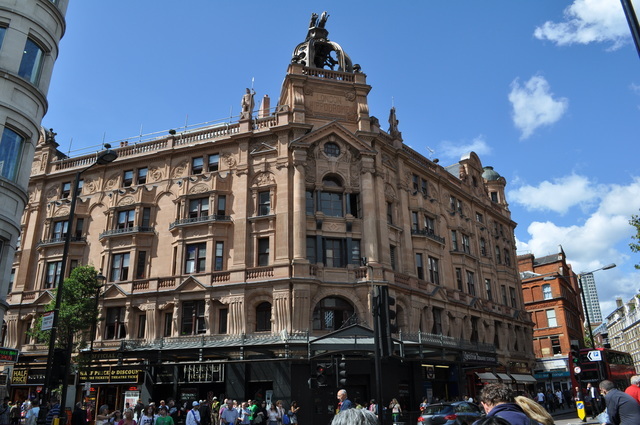 We had 2 4 star reviews – one in the Independent and one in The Times, both are posted on the Facebook pages below if you want to read them and missed them. Here are the February dates which see me in Stockport – home town – hope old friends can come – and Leeds – my first university town – London was the second – I lived in Leeds for 3 great years and saw some fabulous bands there and met some wonderful people. New Forest is always grand and I’m doing my usual Vortex Valentine’s with Jenny Carr and of course the superb new St James Theatre with my great friend and collaborator Simon Wallace and on bass, Neville Malcolm. BARB Jungr continues to justify her reputation as one of the world’s most foremost interpreters of song with her latest album, Stockport to Memphis. But she also shows herself to be an astute song-writer in her own right by including five of her own songs. The result is a really great listen, neatly combining new interpretations of classic tracks from the likes of Tom Waits, Joni Mitchell, Sam Cooke and Bob Dylan to those she has written with Simon Wallace. The album begins with title track and new recording Stockport to Memphis, which has a classic Northern soul vibe, complete with some smouldering harmonica arrangements. It’s upbeat, toe-tapping fun instrumentally, yet indicative of the singer’s own journey lyrically. For as a teenage girl in 1960s Stockport, Barb nurtured a longing for what Memphis represented – namely, the sweet soul music she danced to in clubs at night, and its sense of a bigger, more beautiful world than the northern industrial town she couldn’t wait to leave. The song is a fabulous way to make that point and a really personal tribute to her own success to boot. Sam Cooke’s Change Is Gonna Come follows, stripped back with a subtle piano arrangement for accompaniment, and a blues-jazz style of delivery. It’s tremendously accomplished. Her take on Joni Mitchell’s River, with all of its Christmas sentiments, is – admittedly – a bit of an odd choice but a meaningful song, moodily delivered with the right amount of regret and longing, but Old Man has a wonderfully reflective quality and washes over you serenely and thoughtfully (a sombre piano providing a hauntingly beautiful, even cinematic backdrop). Elsewhere, New Life drops another jazz vibe, complete with subtle use of brass, on another of the Barb Jungr/Simon Wallace penned tracks, while there’s an extremely sensual take on Rod Argent’s She’s (He’s) Not There, which is effortlessly cool. It also brings one of the album’s most instantly recognizable moments. Fisherman’s Blues is another bittersweet moment that’s stripped back, so as to allow Jungr’s stunning vocals to take centre-stage, and which is delivered with just the right amount of longing for escape, while Lay Lady Lay provides another of Jungr’s classic interpretations of a Bob Dylan standard. A further highlight, meanwhile, comes in the sophisticated heartbreak songTill My Broken Heart Begins To Mend (another Jungr offering, co-written with Michael Parker), which once more thrives on a tick-tock percussion and some fabulous harmonica, complete with backing harmonies and a delicious central vocal. Put together, Jungr has delivered another gem of an LP that provides an excellent combination of old and new, as well as definitive proof of why she is regarded as one of the world’s greatest vocalists. Stockport to Memphis Special Edition! You are reading the special extra edition of the News from Pimlico, the Stockport to Memphis issue. If you’re a new subscriber, welcome! Yes, the wait is almost over…the release date for Stockport to Memphis is coming up on the 22nd of October. I know all the fans are waiting eagerly to listen to what looks to be Barb’s best album to date. This newsletter will focus on all things Stockport to Memphis. Please spread the word to anyone that would appreciate the wonderful music Barb created with dedicated and talented team of people. Barb launched Stockport to Memphis in style at the Hippodrome in London at the end of September and I’ve heard fantastic things from the lucky people who saw the show. She will be performing the show throughout the UK and beyond, and there’ll be information on that here, also. The Ask Barb! Q & A column has expanded for this issue and is dedicated exclusively to the Stockport to Memphis related questions. Big thanks to the guest contributors Janet Hasley and Bob McCluckie and Mac Castro for his assistance. Talk about your favourite song/album/performance by Barb or write reviews – we especially invite you to send in reviews for Stockport to Memphis album and shows! The full format will return in the 5th edition. See you all next time. I want to thank everyone who subscribes to this newsletter for their support and good wishes through recent times. I am embarking on a new phase of writing and recording and Stockport to Memphis is a really huge step for me. I’m beyond thrilled with the design of the work and Simon Wallace’s production, and am indebted to all the wonderful musicians who played on the album. I’m performing around the country in coming months and with luck outside the country too – all details will go onto the website. There is a new Facebook page for Stockport to Memphis – click here. Dylan and I will continue to post interesting videos, links, photos and anything else there to do with this project and album. Please do ‘like’ it and come and comment. There is also a YouTube playlist of both videos I am making for the tracks and also live recordings of the new Stockport to Memphis R’n’B Band. You can see these here, again, please share the videos and comment on them, it helps our reach and expands our pool of people. I look forward to hearing from you and am filled with gratitude to Lena for beginning and sustaining this newsletter. This is an expanded edition with many questions on Stockport to Memphis. Enjoy! The album charts your life to date. What kind of self-discovery have you made in that time? It’s all in the album. How long have you been wanting to record an album like Stockport to Memphis? It came as an idea and we started working on it immediately. On your new album, the song Till the Broken Heart Begins to Mend is from your Jungr and Parker days. How did the duo begin, and what was it like to write songs and perform with him? I met Michael when we were both in The Three Courgettes. He was a guitarist and singer. There is nothing he didn’t know about American music – country and western, blues and jazz, he was a mine of information. We worked together for 12 years. Writing with Michael was always fun. He was a master of phrases – Till My Broken Heart begins with the line “think I’m going slowly round the bend” and that was a typical lyric – sweet and real and personal. I love Michael Parker. You and Michael Parker subsequently went on a tour to Africa, giving workshops. What do you remember the most about the trip? There were so many. The first was to Sudan, and I subsequently wrote a massive piece about it for Folk Roots. Seeing the Nile was amazing. The birds, the position and shapes of the moon, the birdsong, everything was amazing in the real use of that word. We had our tiny minds blown apart. We met people there who are still friends of mine today. In Sudan, we visited not only Khartoum and Omdurman but drove for 8 hours and stayed in a city in the middle of the country – El Obeid. I saw mirages, and camels, and the song “Little Donkey” played constantly in my head. Memphis has been the setting for so many great albums over the years. Which one’s your favourite? All the Sun recordings – the greatest singers and soul singers came through that city one way or another – its mind-blowing the effect it’s had on popular music, and particularly the musics I love. Which songs took the quickest and the longest time to record on this album? It doesn’t really work that way. Some arrangements take longer, and some things you refine more. But they’re all subjected to the same level of scrutiny. What would the Barb of today say to her younger self in Stockport? You’ve no idea where the road is going to take you. Fasten your seat belt, it’s going to be a bumpy ride. *There will be more Stockport to Memphis Q&A in the future issues. The Stables is situated in the grounds of the home of John Dankworth and Cleo Laine, who had a vision of developing the existing Stables situated in some outbuildings at their home to a purpose built auditorium that could be used not only for jazz but as a venue for a range of concerts, entertainment and educational activities. We arrived early at the venue in order to dine at their restaurant before the performance. Barb and her accompanist Jenny Carr were sitting outside enjoying the view and we were able to talk to them before eating. The programme was one of the last of Barb’s Bob Dylan concerts before the start of her Stockport to Memphis launch.We have heard the programme many times over the year but it never stops to amaze us that it is always somehow different. Barb’s love of Dylan’s songs shone through. There were problems with the sound system throughout the first set but Barb rose above it and did not let the problems spoil people’s enjoyment. The difficulties were overcome during the break and the sound system was perfect for the second half of the programme. The audience were very appreciative of Barb and Jenny’s performance. Many of the audience were seeing them for the first time and there was much discussion afterwards about how much they had enjoyed the evening. This was also evident by the number of people who bought the CDs and were delighted when Barb signed them at the end of the evening. People queueing up to get their CDs signed after the show. Did someone forward you this newsletter? Did you come across this newsletter by chance? Click here to fill in the form and become a part of this fan club. Please feel free to share this with your friends and family who might also like to join! Stockport to Memphis – the countdown begins! 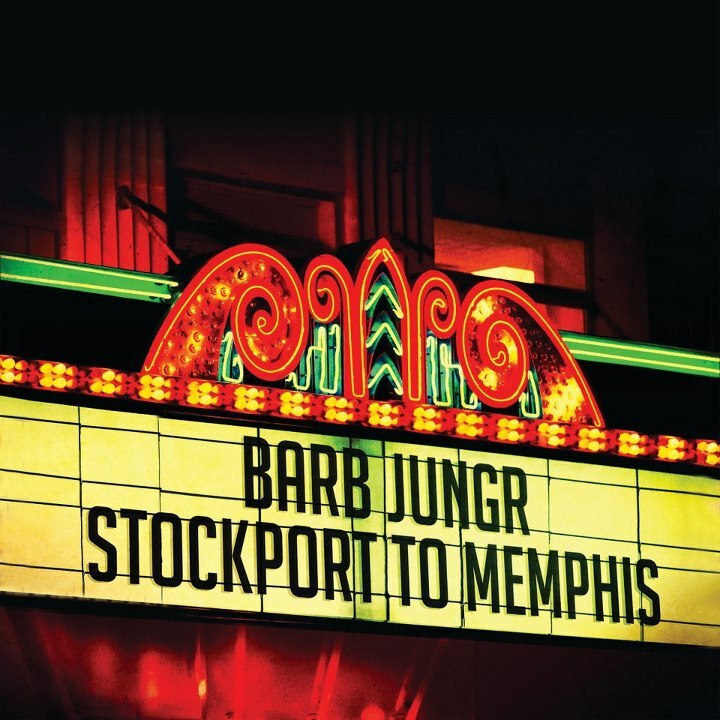 Barb’s much anticipated new album, Stockport to Memphis is due to be released on Naim Jazz (naimcd179) on 22nd October. Click here to get all the information on the album on Barb’s website. She launched Stockport and Memphis at the Hippodrome and word has it that she was spectacular, but would you expect anything less?! Here is the review of the show by Paul Vale of The Stage. 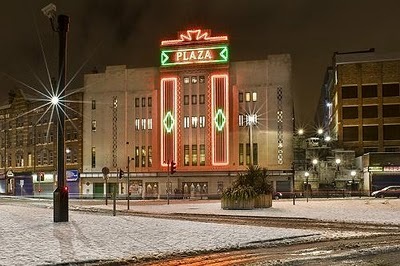 ‘Like’ Stockport to Memphis page on Facebook and keep up to date on the latest news. The Fan Club member will receive 20% off when they purchase Stockport to Memphis!! Please follow these steps when placing the order to claim your discount. To use the code, you must first have an account with Naim Label. Click here to register to create an account or sign in. Click here and go to the Stockport to Memphis page to place the order. Click on the “Buy Now” button, available at the top right of the page. At the bottom of this page, enter the discount code SPTMPO1201in the ‘Promotion Code’ box. Click the ‘Add’ button (important!) then you should see a price reduction of 20%. From there, simply follow the payment instructions to complete your order. Have you had a look around on Barb’s YouTube Channel yet? It features playlists of all her repertoire works – Dylan, Cohen, Joni Mitchell, Springsteen, blues, R’n’B, jazz, soul, cabaret, live shows, animations, original work, original videos, interviews, TV appearances and more. The live performances are from her tours in the UK, USA, Australia and other countries. In the last few weeks, clips of her Stockport to Memphis launch at the Hippodrome as well as the brilliant video of the title track of her new album have been uploaded. Click here to watch the latest clips! Videos of her performance at the Ed Fringe have also been uploaded last month. It’s constantly being updated with new clips of her songs and shows. Subscribe to her channel and you’ll never miss the new uploads. Barb’s official website has been Stockport to Memphisified! It’s a one-stop-shop for all Barb Jungr related matters. You can get all the info, including all her albums, news, live dates, links, her past/present/future projects and much more. Take a moment to browse the new-look website and see what’s happening at the Barb Jungr headquarters. I first discovered Barb’s live music a few years ago when she did a gig at the Royal Northern College of Music. I was aware of some of her songs from her move to the audiophile hifi company Naim’s music label. I took my wife along and what a performance! My wife left raving about what she had heard. Subsequently we caught up with her in the intimate confines of the Cinammon Club in Bowden. This night was even better. Barb close enough to touch was in fine form with her singing immaculate as always but also with her chat and the pianist was brilliant too! Unfortunately her visits back home “oop North” aren’t frequent enough and invariably clash with other things in our schedules. We will however be reacquainting ourselves with our favourite Stockport chanteuse as soon as possible! Lots of great shows coming up as Barb takes Stockport to Memphis and other shows around the UK. Say hello to her, get your CDs signed and take a photo with her after the show! Barb Jungr celebrates Core’s 2nd Birthday with a brand new song cycle inspired by the people and stories of Corby. For the 26th’s tickets and info, click here. For the 27th’s tickets and info, click here. For live dates beyond November,click here. Having missed Barb’s Songs of Summer show at the Pump house in Aldeburgh, My husband and I caught up with them in June at The Vortex Jazz Club, which is run entirely by volunteers. Barb was accompanied by Jenny Carr on piano. The evening comprised of some ‘happy songs’ e.g. “Beautiful Life”, “Feeling Good”, “I’m a Believer”, songs of utter desolation and depression, e.g. “Lilac Wine”, “Ode to Billy Joe”, “Rainy Day” as well as songs of Bob Dylan e.g. “If Not For You”, “I’ll be Your Baby Tonight”. The programme finished with the hope for a brighter future with George Harrison’s “Here Comes the Sun”. The programme consisted of a cross section of songs from a range of Barb’s CDs. Outside, the rain was teeming down, but inside was a warm atmosphere, with an attentive audience that hung on every word of the introductions and songs. The evening ended with loud applause and calls for more. We left the Vortex, stepping out into the torrential rain, which could not dampen our spirits. We were filled with warmth and elation while waiting for our taxi in the rain. 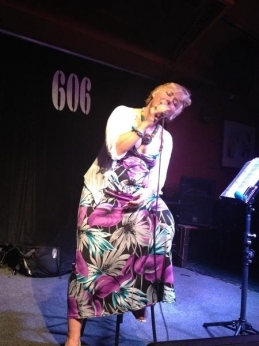 Barb Jungr has never been to Memphis. But as a teenage girl in 1960s Stockport, she nurtured a longing for what it represented; the sweet soul music she danced to in clubs at night, and its sense of a bigger, more beautiful world than the Lancashire industrial town she couldn’t wait to leave. The journey Jungr subsequently went on was unpredictable and often dangerous, taking her from punk London to a besieged Sudanese island, and post-9/11 New York. All the while she was refining her art as an interpretative singer over numerous collaborations and 10 solo albums, taking on French chanson, and the songs of the greatest post-war singers – Elvis Presley, Nina Simone – and writers: especially Dylan, whose work she inhabited as fully as anyone except Dylan himself, on two acclaimed albums and transatlantic sell-out shows. Barb Jungr has travelled very far from Stockport. And now she’s back. Jungr had played in bands with friends in Stockport, Manchester and Leeds. Arriving in London in 1976, as punk exploded, remade her. “My boyfriend said, ‘I don’t understand why you don’t become a singer.’ It was like somebody opening a door.” She saw every band she could. One had as a member composer Paul Sand, son-in-law of playwright Pam Gems, beginning Jungr’s simultaneous connection to musical and theatrical worlds she’s never seen as separate. With the country on the cusp of civil war, Jungr and Parker “ran away” from their minders to an island occupied by South Sudanese rebels. “The bougainvillea’s hanging, the Nile’s flowing past your window, and you’re inside with a bunch of people who’d walked 100 miles for freedom.” Then they went still further out. “In Cameroon, we took a three-week tour into the bush. We knew there was a whole different world the minute you left the street-lights.” Finally came Malawi, and “another level of poverty, because most of it’s baked earth, and life is so hard.” Everywhere music was played, exchanged, absorbed. As well as Dylan, Jungr’s interpretations on Stockport To Memphis include Neil Young’s “Old Man”, Hank Williams’ “Lost On The River”, Mike Scott’s “Fisherman’s Blues”, Tom Waits’ “Down In The Hole”, and Rod Argent’s Zombies hit “She’s Not There”, gender-switched and minus harmonies. And then there’s Sam Cooke’s “A Change Is Gonna Come”. On a long and rich journey with so many unplanned stops, it takes her back to the clubs in Stockport where she started and, dreaming of Memphis, couldn’t wait to leave. So the new CD – Stockport to Memphis – is finished, and about to hit the streets – official release date is 22nd October but its already available for pre ordering from Amazon, which is scary and brilliant. Meanwhile my friend is on Celebrity Big Brother, and doing marvellously – as I expected he would – so that’s lovely. And the gigs start kind of now. I had such a lazy summer, even though the weather wasn’t great, I managed to lie for 4 separate half hours in the garden and get the makings of a tan, and did yoga with Norman Blaire and Amanda Denton and ran in the gym, and followed stage 2 of Zoe Harcombe in league with my NY Scouse mate Jane Buchanan, drank wine and went to the cinema and saw Arsenal’s first match of the season with Ernest and the semi finals of the women’s basketball – also with Ernest, and ate pasta at Sugo and saw Erika and Kasia there….and walked the Dorset coastal path and all the way around Portland Bill. Should have done more writing, but that’s happening now, so its been summer….and lovely. Autumn crowding in, with Corby hotting up, we’ve been doing the writing workshops all through the summer and now the concert there is becoming a reality and the CD plans and sleeve design and photographs – went to Stockport Plaza with Emily Dennison and Ailsa for those….and Edinburgh at the Festival was wonderful even though it was a whistle stop and Habie Schwarz took some fabulous photos there and Billy Watson shot some video footage thats now up on youtube…its all been go. And I managed to visit Wendy Lee and eat cheesecake. Good films through the summer – The Imposter, the Sixto Rogriguez documentary, and the new Brit Marling film – we loved Another World, JP and I, and we weren’t disappointed with The Sound of My Voice, either. Saw London Road – again – worth every second – and Yes Minister – because my mum really wanted to see it…good books, well, I discovered Jonathan Franzen andcouldn’t put down Freedom and then started on The Corrections straight away…saw Richard Rodney Bennet and Claire Martin (with whom I had a fab day in Brighton) at Ronnie Scott’s give their superb performance which was a masterclass in the Great American Songbook….met Don Black at the Proms Literary recording on which we were both guests, and then Ernest and I saw the Broadway Proms which was fun…did a wonderful workshop with Peter Glanville on our new piece for the Little Angel which will open next year….and did I say the new CD is out soon…..with the London launch at The Hippodrome from 24th September, and the out of London first show at Greenham on this friday. The big news is that the new CD Stockport To Memphis is just about finished – artwork is being done and notes and press releases written and I am learning how to make movies so look out world. The album is released on 22nd October but I’ll let you know via the fan club if early copies are available. Contact Lena at barbjungrfanclub@gmail.com to join. Meanwhile I am at The Edinburgh Fringe for ONE NIGHT ONLY at the glorious Queen’s Hall on August 10th and in Northamptonshire and London, before the new songs unveil – details below. Hope to see you there, please let Edinburgh friends know if they will be up there. Its been a superb spring and early summer and at last we are nearing the finish of the new CD, which will be available live from late September and released in October in the UK. There’ll be tons more news on it soon but its been a total joy working on it and I can’t wait to get it out into the world. Meanwhile there are some lovely summer shows, in June in Margate and Corby, while in July there’s the last outing of the current Dylan show in London, at the Arts Theatre, please don’t miss it if you haven’t heard this collection, its a joy, and I love singing these Dylan songs – and in August a “best of Barb” show at the Queen’s Hall at the Edinburgh Festival with Simon Wallace on piano – all dates are on the website.